My first ever "serious" road bike was a Lejeune Pro I purchased in 1975 or '76 from International Pro Bike Shop in Dayton Ohio. It was a bright red, had one or two chrome like decals, Mafac brakes, Simplex frt/rear, Stronglight 93 cranks and that's about all I remember about it. I'd love to have another for my bike "wall of fame" and for special sunny day rolls around the countryside. Any one know of any available or where I might find one? I'd be willing to even pay a finders fee perhaps if information leading to my procurement of a Lejeune Pro actually panned out. Well, good luck. The upper echelon LeJeunes do not show up very often. When they do, they seem to be larger sizes (56cm and above) The only thing to do is haunt the Bay, CL and be persistent. Love the story. Don't have a LeJeune, however. I now own an early 70's TdF because it was the bike I really wanted back in '71-2 but had to settle for the Interclub. Good luck in your quest! Mr. Travers and I both like LeJeunes. They are not bought for there beatiful workmanship, but are well made, just a bit quick and or sloppy perhaps, but that might be the secret, no extended time at temp for the steel, flow, overflow and go. I was fortunate to buy my old one back years after I sold it, for the same price even. I then bought some others as the original has gained sentimental value over the decades. They do show up, but the prices have been rising. Perhaps its Norris Lockney talking them up. this imaged bike is interesting as it has more "relaxed" geometry, more fork rake and slacker seat tube angle than many others I have seen with this transfer set, more like an earlier bike. It appears LeJeune subcontracted out many if not all the frame construction, but the geometry at least in the top tiers of bikes is predictable, but this blends earlier geometry and later graphics. This is my favorite graphics package, very "pro" big name, often, almost everywhere, in images of racing at the time geat for the sponsoring mfg. as almost any angle shows the name at least once. I believe this seller is now a BF member. Not what the OP is looking for. 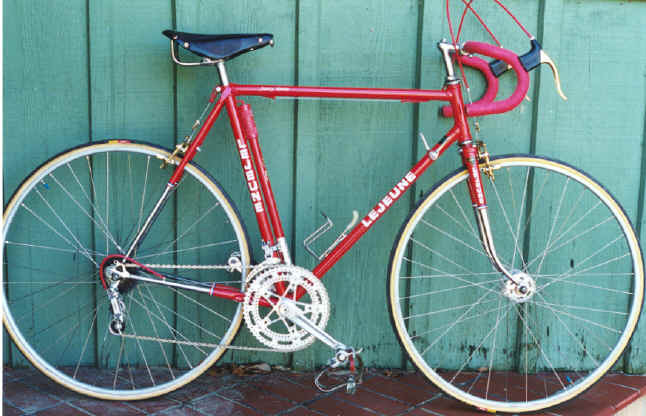 When I worked at a Peugeot-Nishiki dealership in the early 1970s, the shop owner ordered several LeJeunes, which came with full Reynolds 531 tubing, French-threaded TA Professional 3-bolt crankset, Simplex derailleurs, Mafac centerpulls, Normandy Luxe Competition hubset, tubulars, and 52-42/14-16-18-20-22 gearing. They seemed quite comparable to the slightly costlier Peugeot PX-10.